Henry IV (1050–1106) was King of Germany from 1056 and Holy Roman Emperor from 1084, till he was forced to step down in 1105. He was the third emperor of the Salian dynasty and one of the most interesting and important figures of the eleventh century. His reign was marked by the Investiture Controversy with the Papacy and several civil wars with pretenders to his throne in Italy and Germany. Henry was the eldest son of the Emperor Henry III, by his second wife Agnes de Poitou, and was probably born at the royal palace at Goslar. When Henry III unexpectedly died in 1056, the six-year-old Henry IV became king without problems. The Empress Agnes acted as regent, and the German pope Victor II was named as her counsellor. Unlike Henry III, Agnes could not influence the election of the new popes, Stephen IX and Nicholas II. These popes worked together with the Normans of southern Italy. But the first great problem started when Nicholas claimed influence in the election of Germany. Gregory VII, a reformist monk, was elected as pope in 1073. This is when the controversy between emperor and pope began. In the higher ranks of the German clergy, Gregory had many enemies. Therefore King Henry declared Gregory was no longer pope, and the Romans should choose a new pope. When Gregory heard of this he excommunicated Henry IV, declared he was no longer emperor and canceled the oaths the people had sworn to King Henry. The excommunication of the king made a deep impression both in Germany and Italy. Thirty years before, Henry III had deposed three popes, but when Henry IV tried to copy this procedure, he did not have the support of the people. The Saxons began a second rebellion, and the anti-royalist party grew in strength. The situation now became extremely critical for Henry. It became clear that at any price he had to get his absolution from Gregory. At first he tried this by an embassy, but when Gregory rejected this, he went to Italy in person. The pope had already left Rome. Henry tried to force the pope to grant him absolution by doing penance before him at Canossa, where Gregory stayed. For a Christian it seemed impossible to deny a penitent re-entrance into the church, and therefore Gregory removed the ban. But a new conflict followed because Henry IV thought the end of excommunication meant he was king again. But Gregory did not decide that. 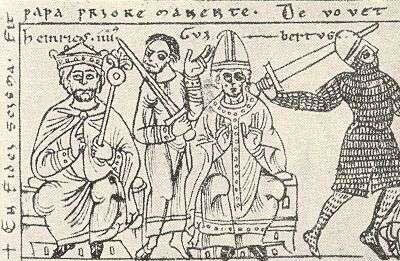 The rebellious German nobles used the excommunication of Henry to set up a rival king, Duke Rudolph of Swabia (Forchheim, March 1077). At first Gregory seemed to be neutral because the two parties (emperor and rebels) were of fairly equal strength. But finally he decided to support Rudolph of Swabia after his victory at Flarchheim (January 27, 1080) and declared the excommunication and deposition of King Henry again (March 7, 1080). This was widely felt to be an injustice. When Rudolph of Swabia died on October 16 of the same year, Henry began to fight to be king. In 1081 he opened the conflict against Gregory in Italy. Gregory had now become less powerful, and thirteen Cardinals stopped supporting him. 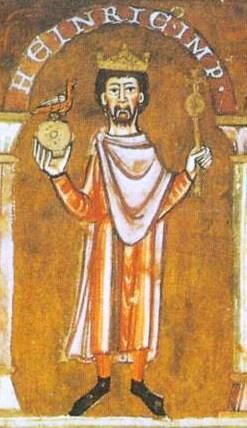 Rome surrendered to the German king, and Guibert of Ravenna was enthroned as Clement III (March 24, 1084). Henry was crowned emperor by his rival, while Gregory himself had to flee from Rome in the company of his Norman "vassal," Robert Guiscard. Agnes of Germany (born 1072), married Frederick I von Staufen, Duke of Swabia. Henry IV, Holy Roman Emperor Facts for Kids. Kiddle Encyclopedia.